As the echo of a spine tingling waiata was still reverberating from the walls of Rikoriko Cave at the Poor Knights Islands, a nervous fleet of open ocean paddlers charged out of the safety of the world’s largest sea cave to tackle 30km of surging sea at this year’s Poor Knights Crossing race. The waiata marked the start of what was an epic open ocean race with Auckland’s Andrew Mowlem delivering a stunning performance of endurance and skill to take out the race ahead of a strong and experienced field. 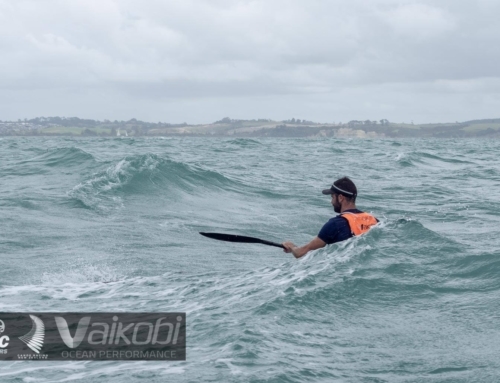 Mowlem, who is building momentum toward a Oceanski World Championship bid in Hong Kong later this year, hit the front as the fleet emerged from the cave and never relinquished it till he had charged across a challenging 30km dash to the finish line inside Tutukaka Harbour two hours later. It was quite a performance in very challenging conditions, with the race fleet greeted with a moderate tailwind coupled with a significant sea swell that threw up some big water. Before starting at the world renowned Poor Knights Islands and Marine Reserve then tackling the 30km paddle back to the mainland, paddlers had already been tested during the ferry out to the start line. Several hit the water feeling worse for wear, some never even got on their race craft as seasickness took hold travelling on one of the fleet of 10 boats that ferried the paddlers and their craft out to the startline. But once the race started it was all on. Mowlem was never headed at the pointy end of the pack. Local Garth Spencer was a clear second until Australian Todd Boreland charged past to take the silver in the oceanski race. Congratulations to all the RAYC members who raced. Their results are highlighted below.